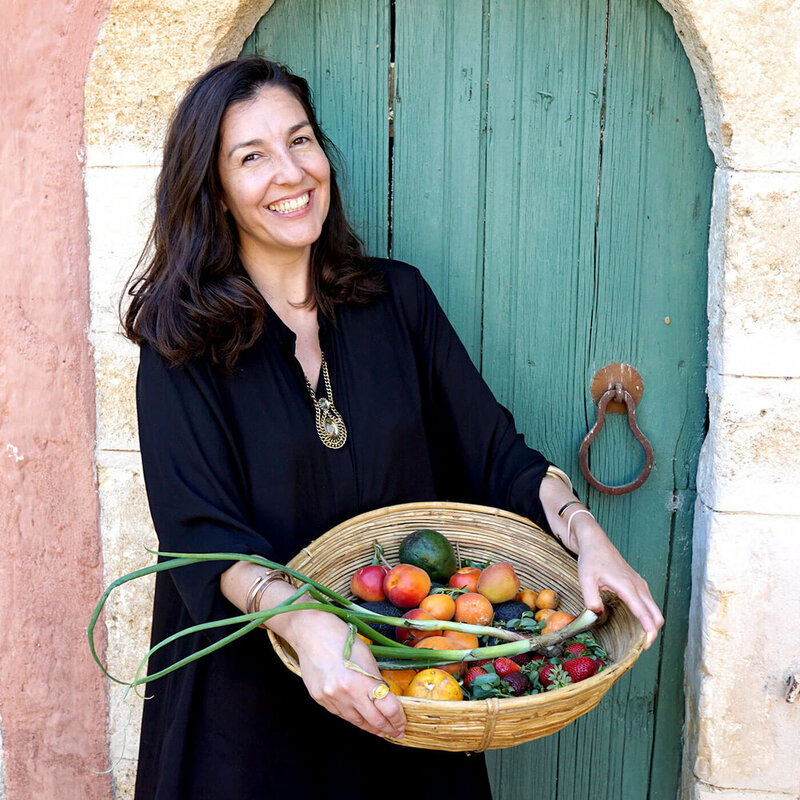 Whilst staying at Metohi Kindelis in the middle of May, I spent some time with Danae Kindeli who is a 4th generation owner of the enchanted Kindelis estate. If you haven’t yet seen my images from this magical holiday, you can find them here. 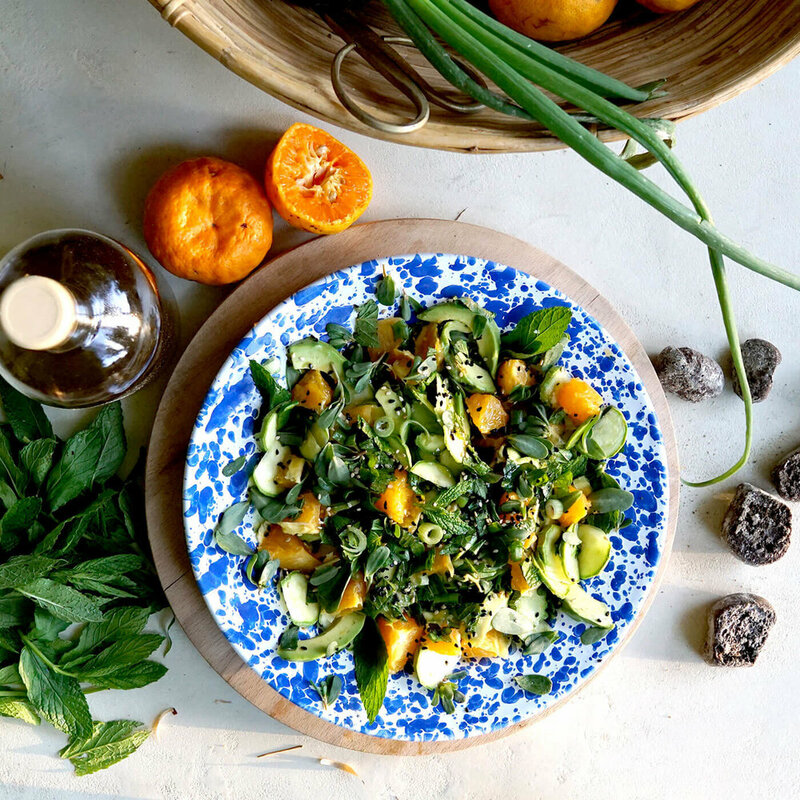 After a walk in the sunshine around the gardens and orchards, Danae shared with me this salad, which was a favourite of her late father, Kyriakos Kindelis. The base of the salad is avocado, orange, mint, lime juice and olive oil. The rest can be customised, depending on what you have available to you, such as the tiny zucchini, wild purslane and spring onions that we picked on our walk around the gardens. I had never thought to combine avocado and orange but the flavours pair so beautifully, I knew this was a recipe I had to share. Danae told me her father used to make this salad for summer nights in the garden with friends. I am so utterly obsessed with this family and their home and it is an honour to share a recipe from their history. My version includes cucumber as an ode to Greece, as well as lambs lettuce instead of purslane which I was unable to find in Berlin at the time of shooting. When we enjoyed it together on the back porch of the Kyriakos guesthouse, we did so with wine and carob rusks, a savory, gluten free Cretan biscuit that I cannot find in Berlin but am determined to recreate, along with the addictive sesame bicscuits I discovered in Crete. This is the first of a few recipes I will share from our time in Greece, so stay tuned and enjoy! Arrange the leafy green on a plate or wooden board. Top with avocado, orange, cucumber, mint and spring onion. Squeeze lime juice and drizzle olive oil over the top. Garnish with sesame seeds and add salt to taste. Enjoy immediately.